Everyone experiences an event at some point in their lives where they think, “I really wish we had hired a car service.” Sometimes you head to a party, picnic, or event and trying to find a parking spot is nearly impossible. Maybe you also have a couple drinks and end up leaving your car there overnight, coming back the next day to find a hefty parking ticket on your windshield, or even worse, notice that your car has been towed. As your Atlanta event transportation company, we are going to offer up a handful of events that, if you haven’t already hired a car or bus service, you’ll wish you did. Keep reading to learn more! Bachelor Or Bachelorette Party: Most pre-wedding festivities involving either the bridal party or the groomsmen involve a night on the town, which often involves consuming alcohol. For safety reasons, and so that one friend doesn’t have to be consigned to the less-than-fun role of designated driver, hiring event transportation services can be a great addition to the night! Plus, when you choose one of our party busses, you can rest easy knowing that the party doesn’t stop when the bus shows up! Wedding: While a wedding is a magical moment, the hours leading up to a wedding are often full of stress, even for the most well-planned events. Hiring wedding transportation services can ensure everyone gets to the wedding on time. It also gives the wedding couple and wedding party the ability to safely text and call each other about last minute details. But pre-wedding isn’t the only time transportation services matter. We can also serve as a shuttle bus to get your guests to their hotel accommodations and ensure that the bridal party leaves in style and safety after a long night. Family Reunion: Family reunions are typically held at parks or event centers, and more often than not, family members fly in from out of town to meet at a certain location. Hiring us to help shuttle everyone from their hotel to the reunion means that nobody has to rent a car or drive themselves. This gives family members time to catch up without having to split into separate cars. Company Holiday Party: If you are attending a company holiday party, or even more so, if you are a business throwing a company party, having the right transportation can make or break the night. For employees whose companies did not arrange transportation, splitting the cost of a quality transportation service will allow you to indulge in some free alcoholic beverages, get home safe, and spend some quality time with coworkers. For business owners, arranging discounted hotel rooms near the venue and providing a shuttle bus-type service will let your employees know you want to go the extra mile for them. School Dances: School dances are a big deal for high schoolers, and hiring a homecoming or prom limo will make your teenagers feel special while giving you the peace of mind that they are getting there and back home safely. Graduation Ceremony: Whether it is a high school or a college graduation, one thing is certain: Parking will likely be a mess. The last thing you want is to miss the first fifteen minutes of your child’s graduation ceremony because you were circling the parking lot. Our transportation services can pick the entire family up at your house and drop you off at the graduation ceremony. We can then pick you up and return you home safe and sound afterwards. Bar Crawl: Whether you are going out for Saint Patrick’s Day or to celebrate a birthday, hiring a shuttle for the evening of a bar crawl will help you and your friends get around without a problem. Just let your driver know where you’re going and when to pick you up, and you can count on us to get you from point A to point B (and points C, D, E, F, and G as well). Need An Atlanta Event Transportation Service You Can Count On? Corporate Transportation is your Atlanta car and bus service here to make your next event special! Our highly trained and regularly drug-checked drivers are the best in the industry, and our huge fleet can transport a couple hundred people. 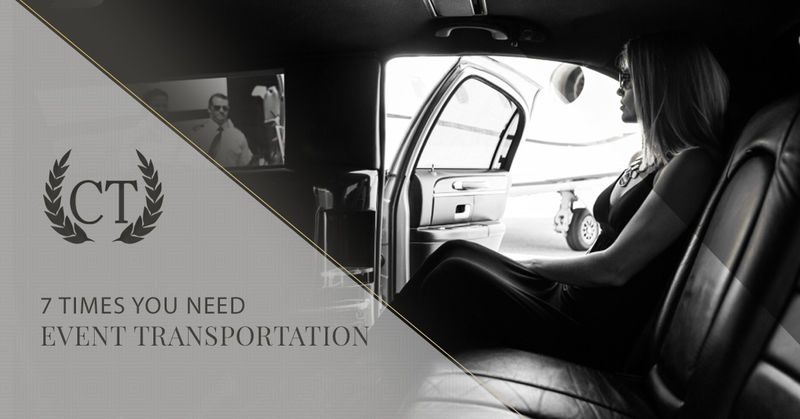 We offer everything from black car services for executives to stretch limos and charter busses. Reserve your transportation today, or get in touch if you have any questions!